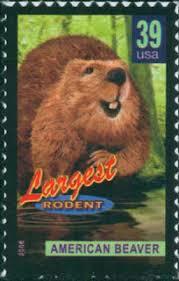 Displayed here are postal cancellations from U. S. post offices in towns named for animals. 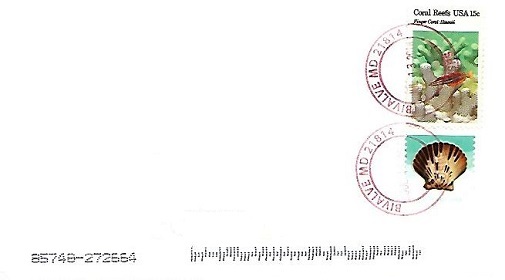 The postmarks are illustrated below alphabetically in subject categories. 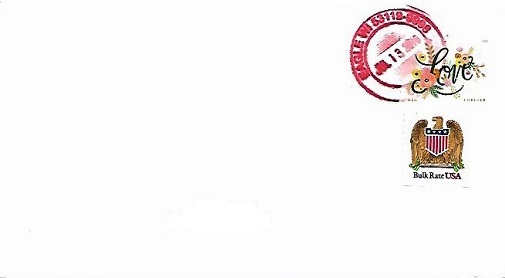 DPO - discontinued post office. 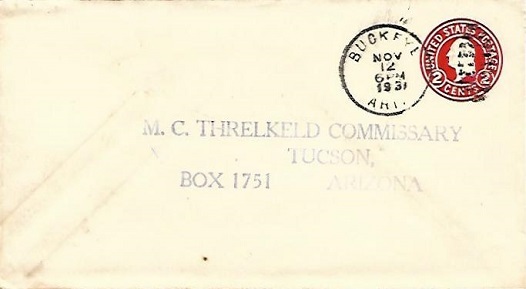 Hand cancellation: "BUCKEYE, ARIZ. NOV 12 1931". 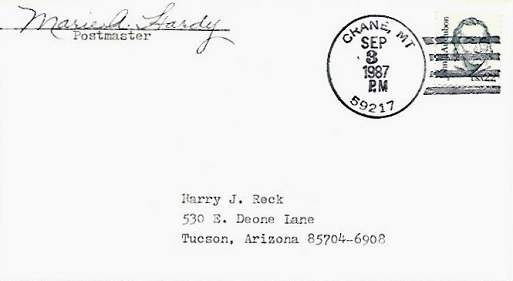 Machine cancellation: "BUCKEYE, ARIZ. MAY 10 1939". 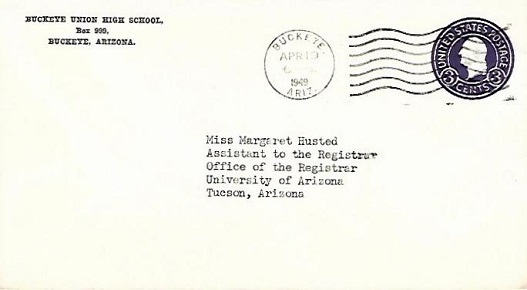 Machine cancellation: "BUCKEYE, ARIZ. APR 19 1949". 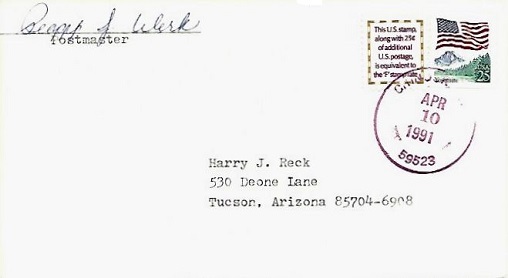 Hand cancellation: "BUCKEYE, AZ 85326-9998 USPS JUL 21 2018". 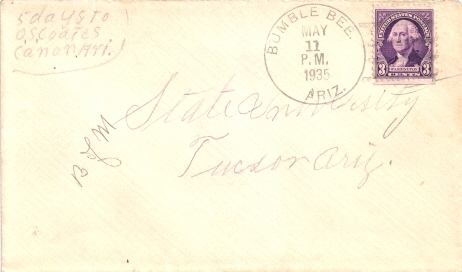 Hand cancellation: "BUMBLE BEE, ARIZ. MAY 11 1935". 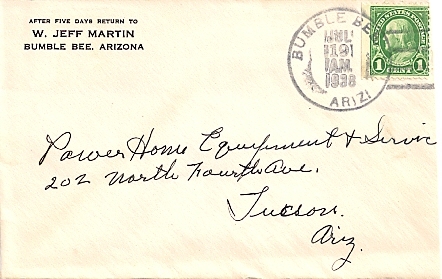 Hand cancellation: "BUMBLE BEE, ARIZ. JUL 19 1938". 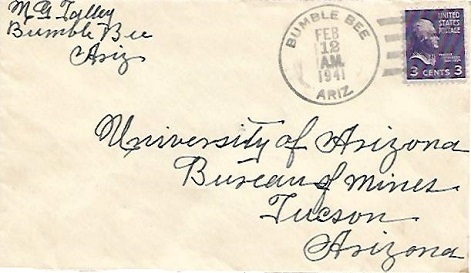 Hand cancellation: "BUMBLE BEE, ARIZ. FEB 12 1941". 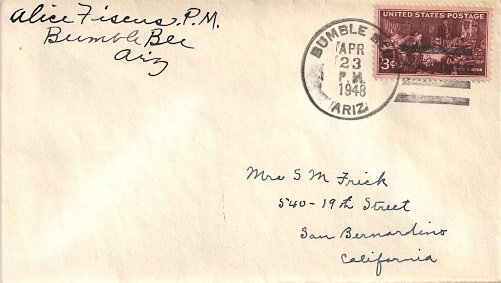 Hand cancellation: "BUMBLE BEE, ARIZ. APR 23 1948". 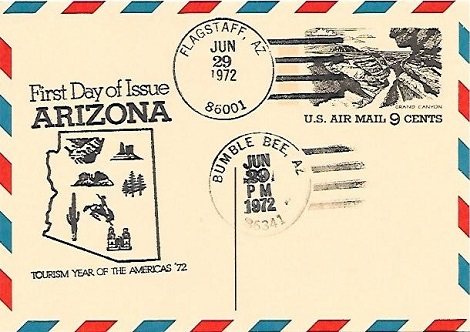 Hand cancellation: "BUMBLE BEE, AZ 86341 JUN 29 1972". 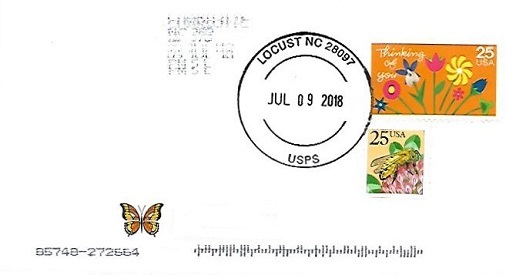 Hand cancellation: "LOCUST, NC 28097 USPS JUL 9 2018". 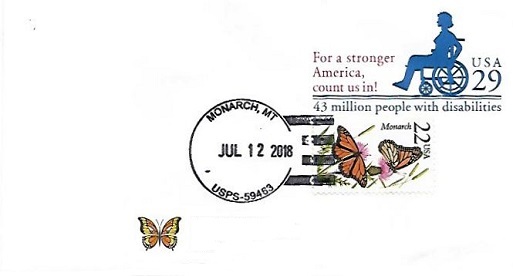 Hand cancellation: "MONARCH, MT 59463 USPS JUL 12 2018". 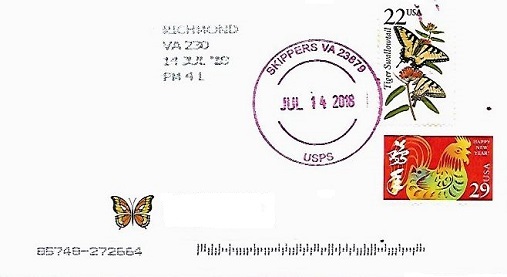 Hand cancellation: "SKIPPERS, VA 23879 USPS JUL 14 2018". 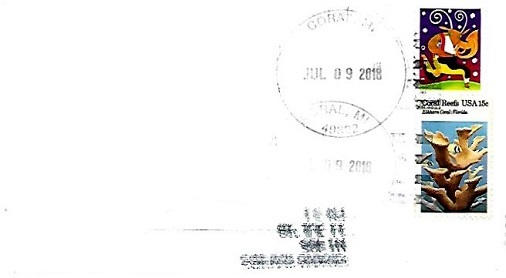 Hand cancellation: "CORAL, MI 49322 JUL 9 2018". 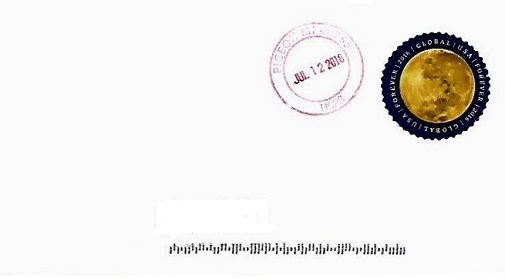 Hand cancellation: "BIVALVE, MD 21814 USPS JUL 13 2018". 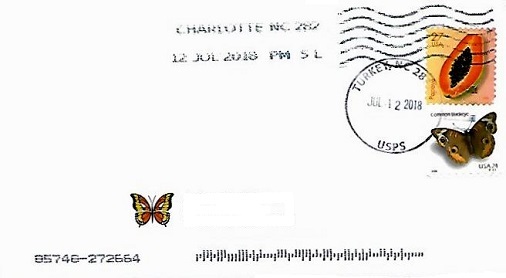 Hand cancellation: "MOLLUSK, VA 22517 USPS JUL 9 2018". Hand cancellation: "MUSSELSHELL, MT 59059 JUN 23 1989". 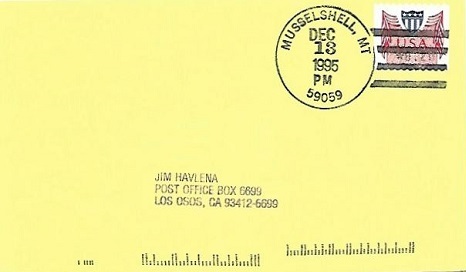 Hand cancellation: "MUSSELSHELL, MT 59059 DEC 13 1995". 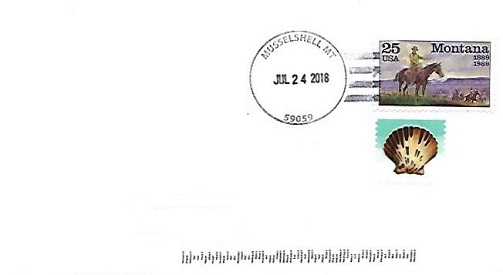 Hand cancellation: "MUSSELSHELL, MT 59059 JUL 24 2018". 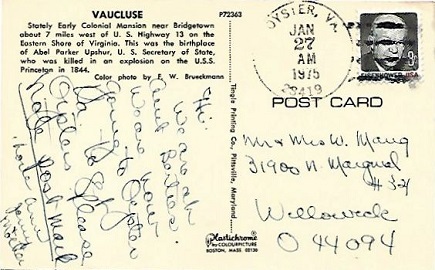 Hand cancellation: "OYSTER, VA 23419 JAN 27 1975". 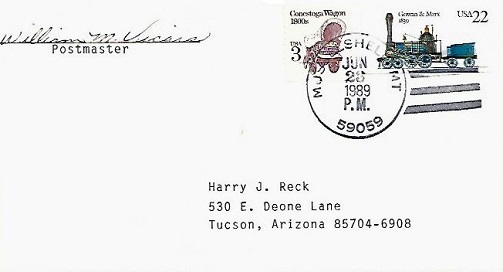 Hand cancellation: "SHELL, WY 82441 MAR 9 1981". 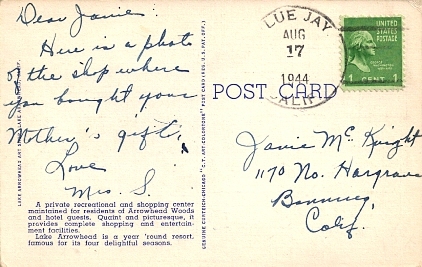 Hand cancellation: "CARP, NEV. JUL 29 1927". Machine cancellation: "CHINOOK, MT 59523 DEC 20 1989". 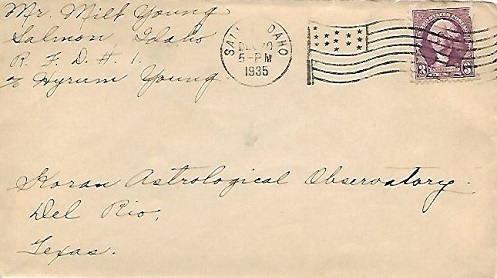 Hand cancellation: "CHINOOK, MT 59523 APR 10 1991". 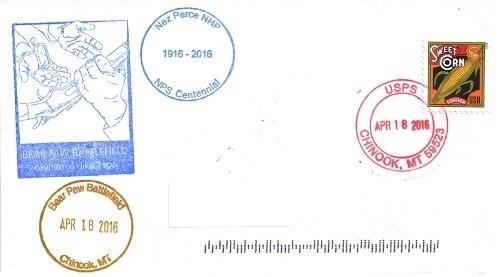 Hand cancellation: "CHINOOK, MT 59523 USPS APR 18 2016". 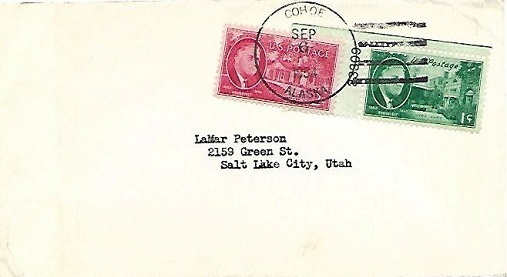 Hand cancellation: "COHOE, ALASKA SEP 6 1954". 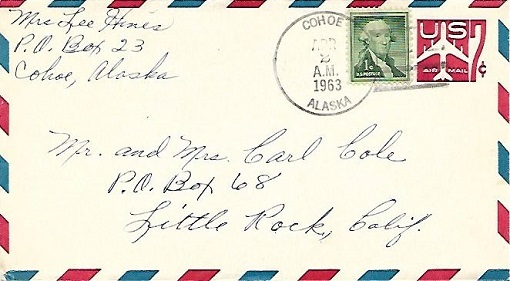 Hand cancellation: "COHOE, ALASKA APR 2 1963". 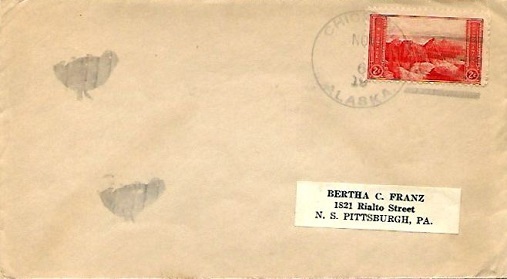 Hand cancellation: "KING SALMON, ALASKA NOV 19 1956". 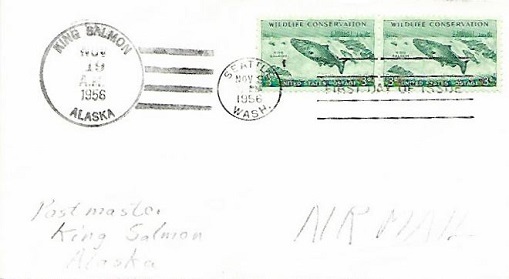 Hand cancellation: "KING SALMON, ALASKA DEC 17 1958". 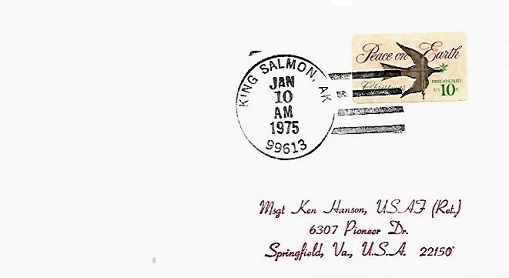 Hand cancellation: "KING SALMON, AK 99613 JAN 10 1975". 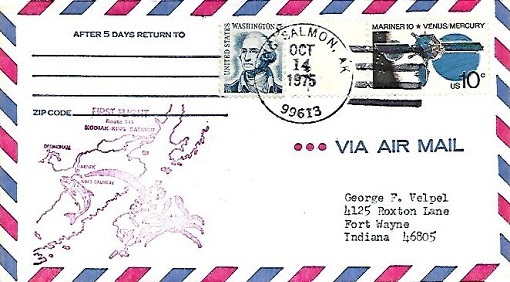 Hand cancellation: "KING SALMON, AK 99613 OCT 14 1975". 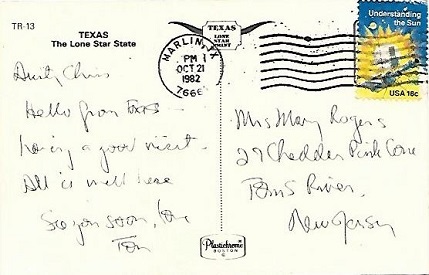 Machine cancellation: "MARLIN, TX 76661 OCT 21 1982". 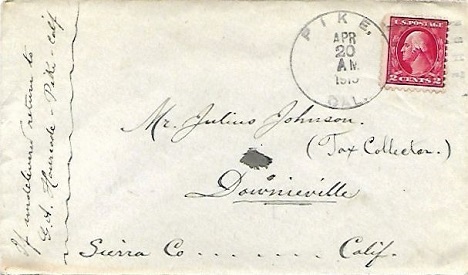 Hand cancellation: "PIKE, CAL. 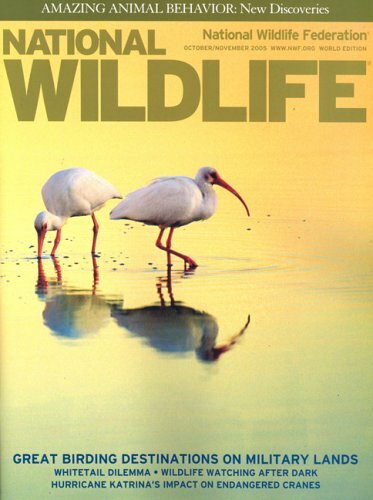 APR 20 1915". 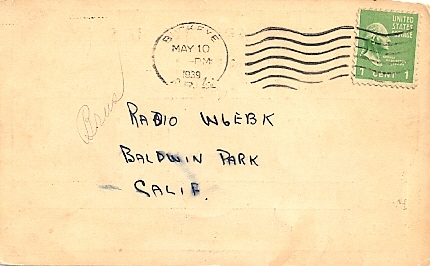 Machine flag cancellation: "SALMON, IDAHO DEC 20 1935". 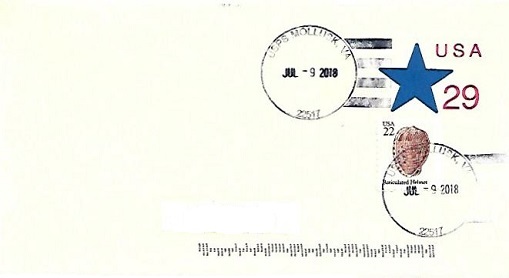 Hand cancellation: "STURGEON, MO 65284 USPS JUL 10 2018". 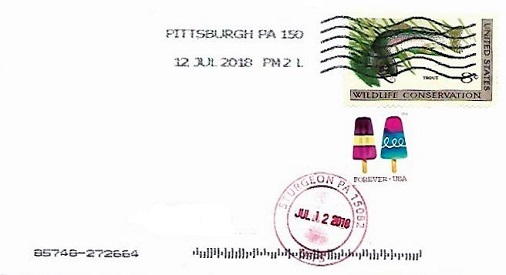 Hand cancellation: "STURGEON, PA 15082 USPS JUL 12 2018". 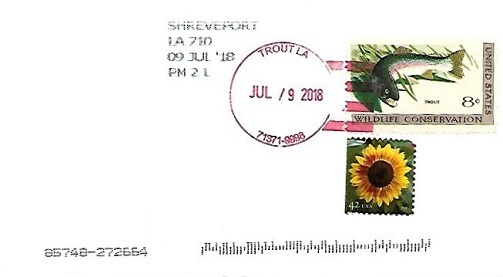 Hand cancellation: "TROUT, LA 71371-9998 JUL 9 2018". Machine slogan cancellation: "WHITEFISH, MONT. 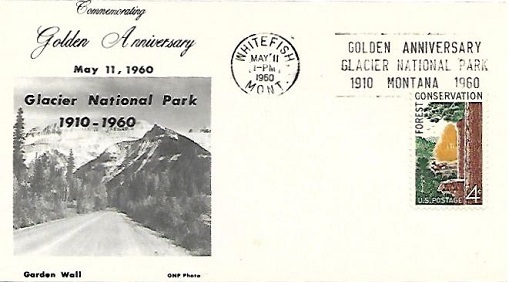 MAY 11 1960 | GOLDEN ANNIVERSARY GLACIER NATIONAL PARK 1910 MONTANA 1960 |". 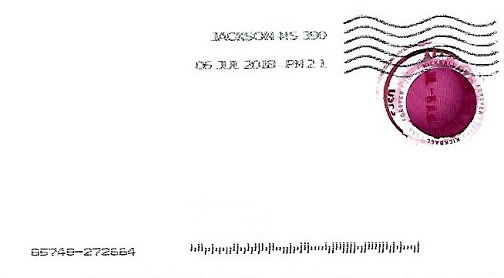 Hand cancellation: "ALLIGATOR, MS 38720 USPS JUL 6 2018". 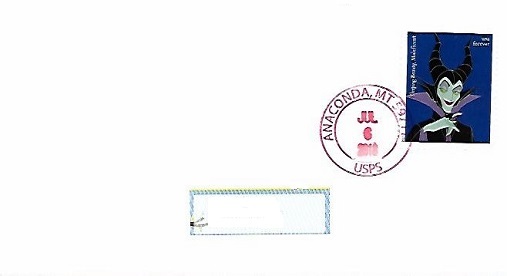 Hand cancellation: "ANACONDA, MT 59711 USPS JUL 6 2018". 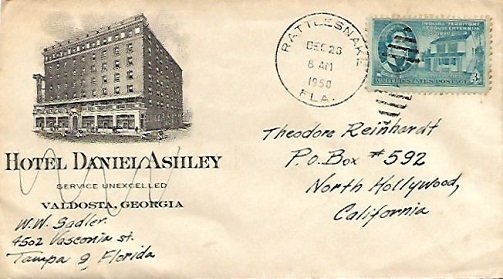 Hand cancellation: "RATTLESNAKE, FLA. DEC 23 1950". 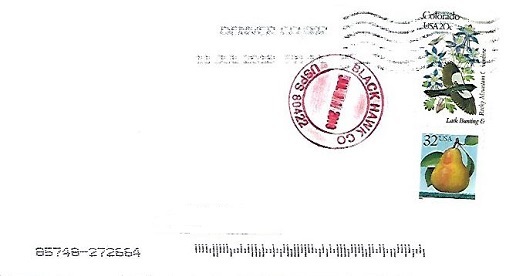 Hand cancellation: "BLACK HAWK, CO 80422 USPS JUL 11 2018". 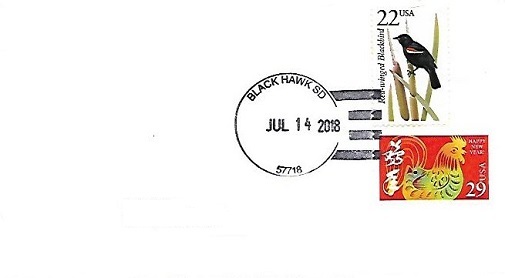 Hand cancellation: "BLACK HAWK, SD 57718 JUL 14 2018". 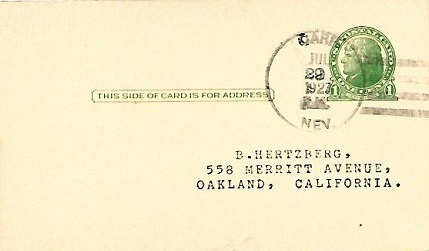 Hand cancellation: "BLUE JAY, CALIF. AUG 17 1944". 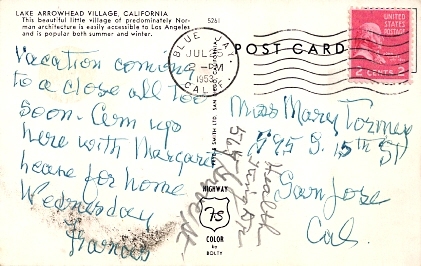 Machine cancellation: "BLUE JAY, CALIF. JUL 25 1953". 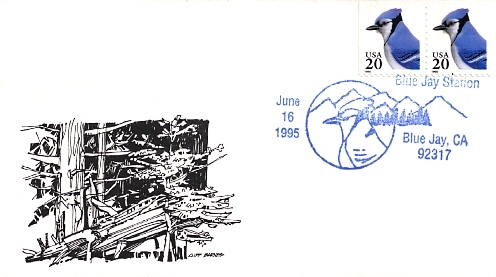 Special hand pictorial cancellation: "Blue Jay Station, Blue Jay, CA 92317 June 16 1995". 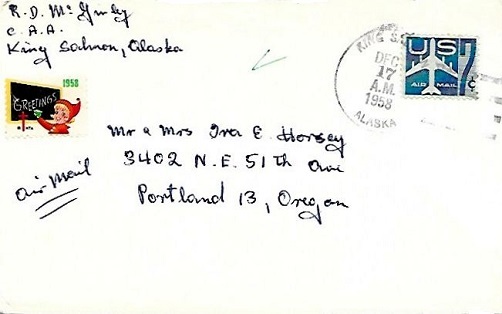 Hand cancellation: "CHICKEN, ALASKA NOV 6 1934". 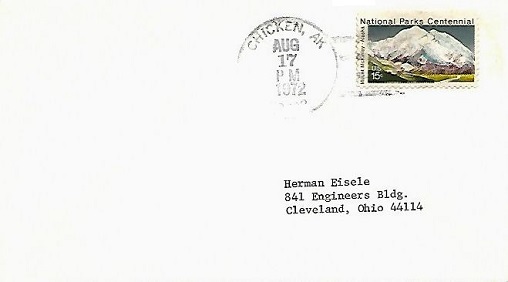 Hand cancellation: "CHICKEN, AK 99732 AUG 17 1972". 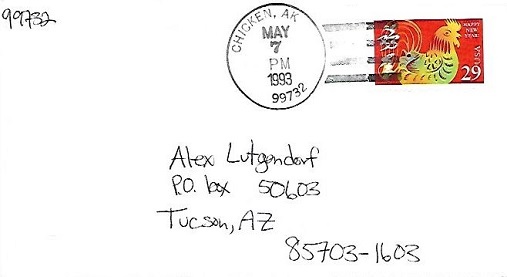 Hand cancellation: "CHICKEN, AK 99732 MAY 7 1993". 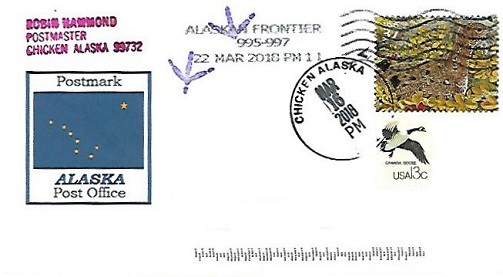 Hand cancellation: "CHICKEN, ALASKA 99732 MAR 16 2018". Hand cancellation: "CRANE, MT 59217 SEP 3 1987". 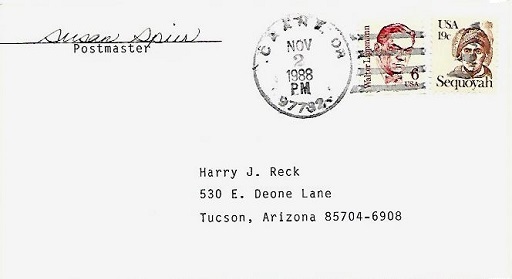 Hand cancellation: "CRANE, MT 59217 APR 11 1989". 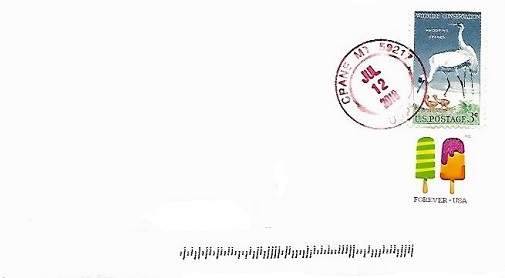 Hand cancellation: "CRANE, MT 59217 USPS JUL 12 2018". 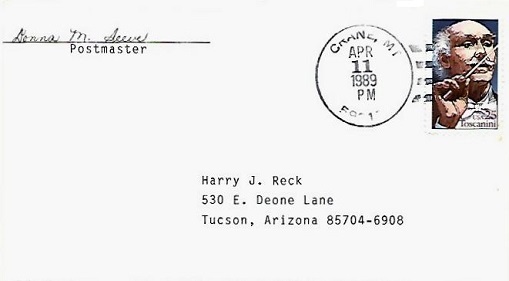 Hand cancellation: "CRANE, OR 97732 NOV 2 1988". 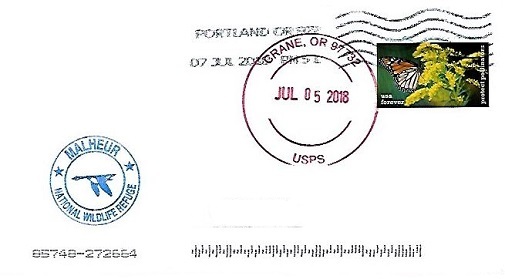 Hand cancellation: "CRANE, OR 97732 USPS JUL 5 2018". 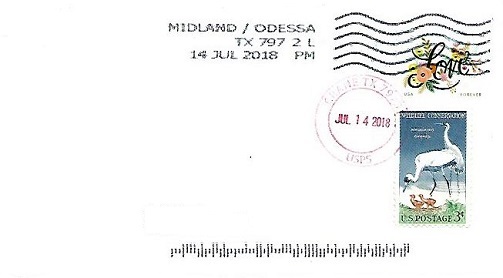 Hand cancellation: "CRANE, TX 79731 USPS JUL 14 2018". 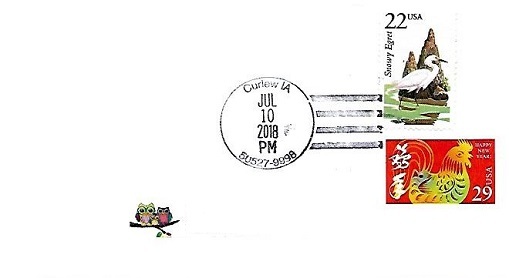 Hand cancellation: "Curlew, IA 50527-9998 JUL 10 2018". 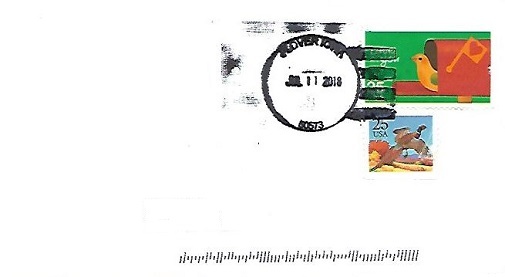 Hand cancellation: "DUCK, NC 27949 USPS JUL 12 2018". 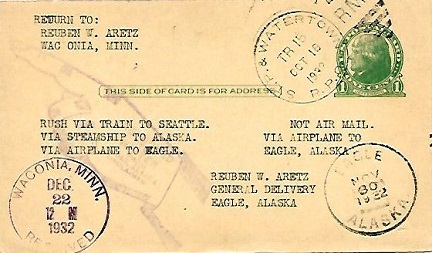 Hand cancellation: "EAGLE, ALASKA NOV 30 1932". 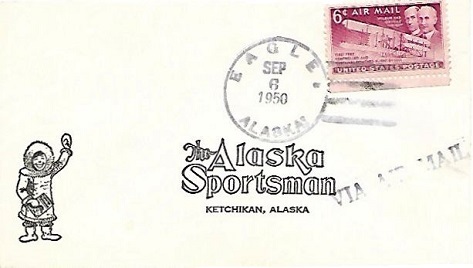 Hand cancellation: "EAGLE, ALASKA SEP 6 1950". 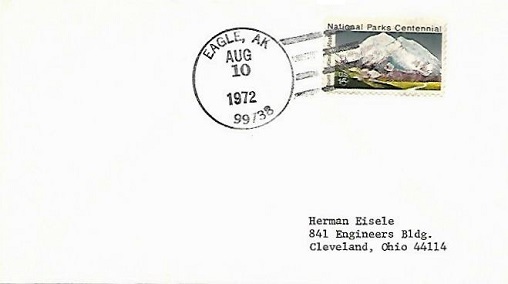 Hand cancellation: "EAGLE, AK 99738 AUG 10 1972". 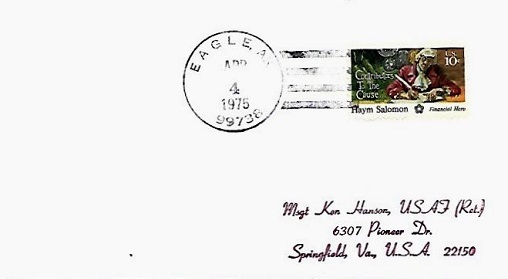 Hand cancellation: "EAGLE, AK 99738 APR 4 1975". 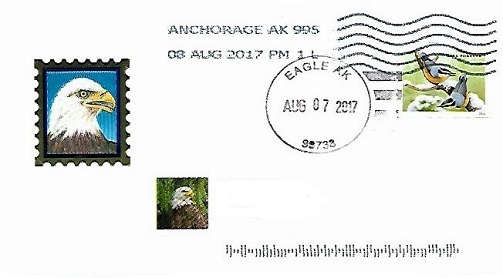 Hand cancellation: "EAGLE, AK 99738 AUG 7 2017". 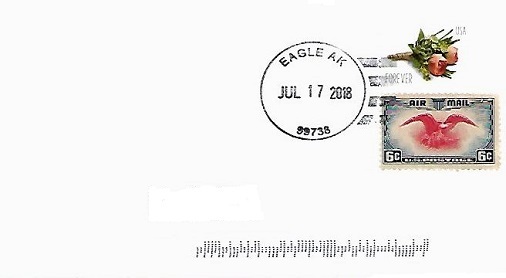 Hand cancellation: "EAGLE, AK 99738 JUL 17 2018". 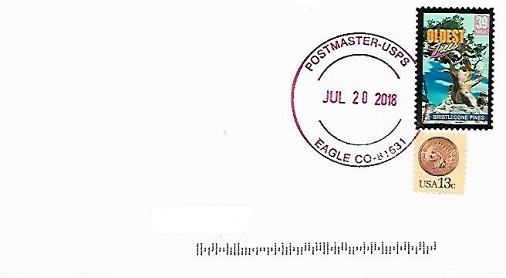 Hand cancellation: "POSTMASTER, EAGLE, CO 81631 USPS JUL 20 2018". 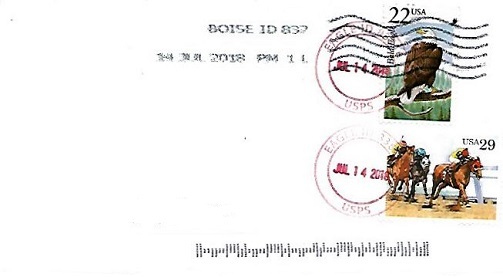 Hand cancellation: "EAGLE, ID 83616 USPS JUL 14 2018". Hand cancellation: "EAGLE, NEBR. 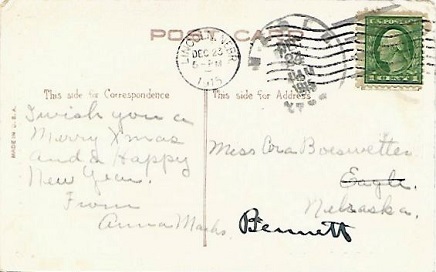 DEC 24 1915". 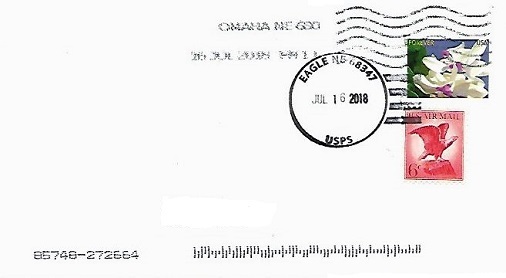 Hand cancellation: "EAGLE, NE 68347 USPS JUL 16 2018". 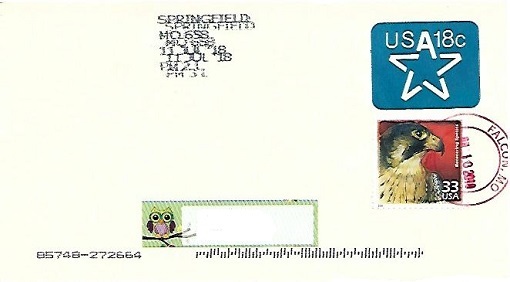 Hand cancellation: "EAGLE, WI 53119-9998 USPS JUL 13 2018". 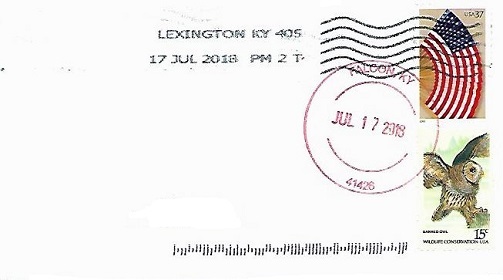 Hand cancellation: "FALCON, KY 41426 JUL 17 2018". 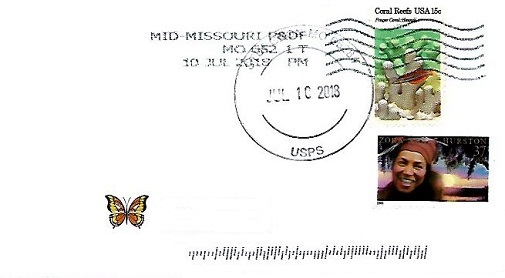 Hand cancellation: "FALCON, MO 65470 JUL 10 2018". 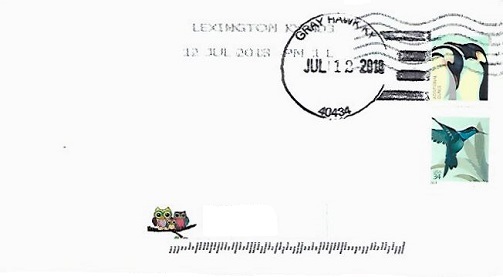 Hand cancellation: "GRAY HAWK, KY 40434 JUL 12 2018". 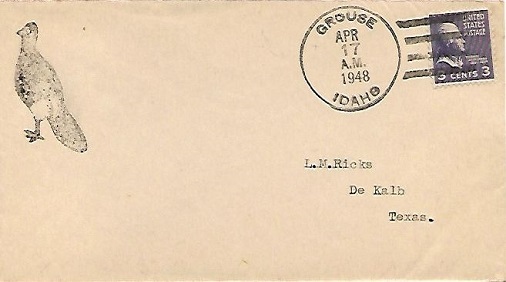 Hand cancellation: "GROUSE, IDAHO APR 17 1948". Hand cancellation: "HERON, MT 59844 JUL 26 2018". 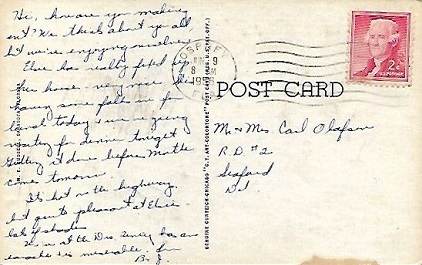 Hand cancellation: "JAY, FLA. SEP 15 1948". 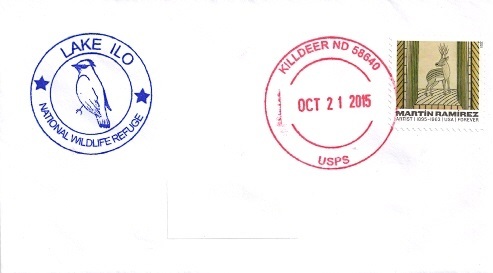 Hand cancellation: "KILLDEER, ND 58640 USPS OCT 21 2015". 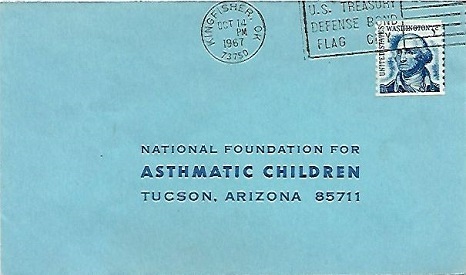 Machine slogan cancellation: "KINGFISHER, OK 73750 OCT 14 1967 | U.S. TREASURY DEFENSE BOND FLAG CITY |". 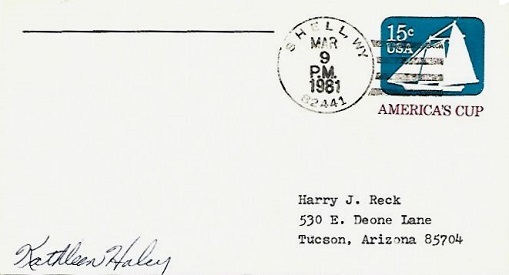 Machine cancellation: "OSPREY, FLA. JUN 9 1956". 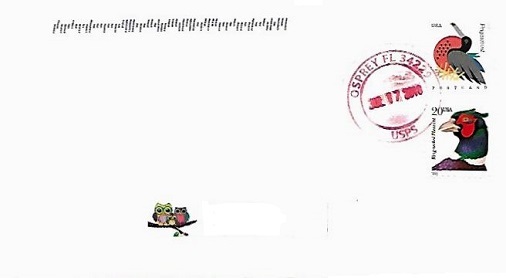 Hand cancellation: "OSPREY, FL 34229 USPS JUL 17 2018". 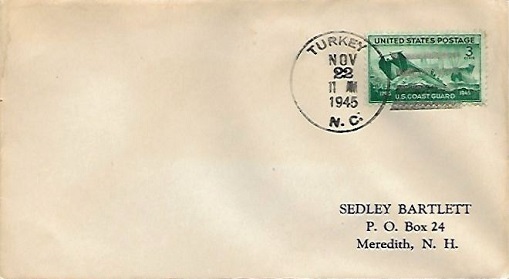 Hand cancellation: "PELICAN, ALASKA MAR 3 1950". 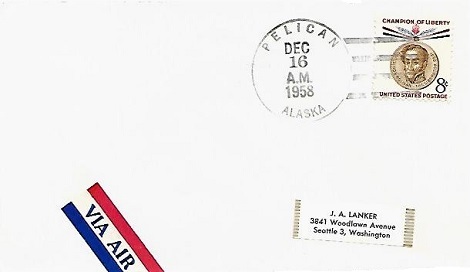 Hand cancellation: "PELICAN, ALASKA DEC 16 1958". 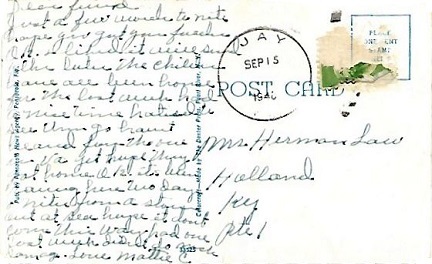 Hand cancellation: "PELICAN, ALASKA SEP 23 1959". 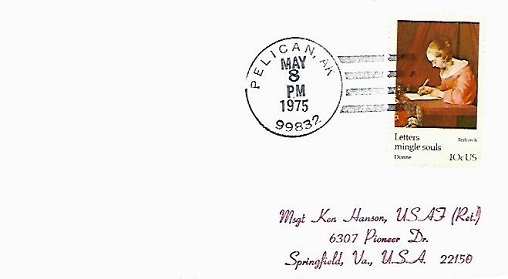 Hand cancellation: "PELICAN, AK 99832 MAY 8 1975". 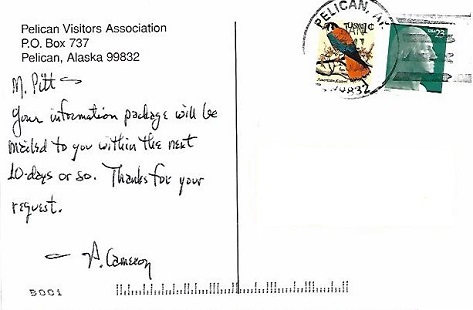 Hand cancellation: "PELICAN, AK 99832 JAN 24 2006". 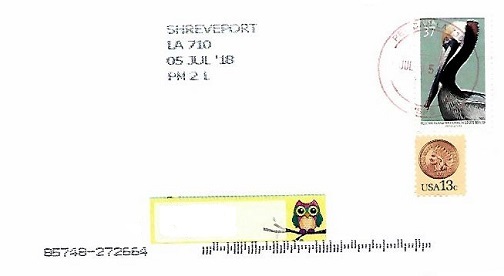 Hand cancellation: "PELICAN, LA 71063 USPS JUL 5 2018". 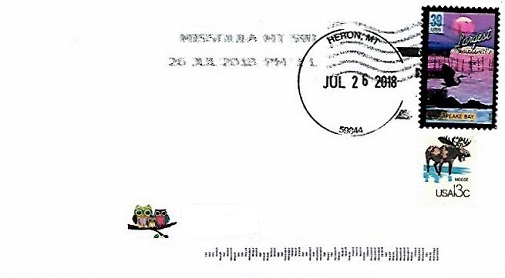 Hand cancellation: "PIGEON, MI 48755 USPS JUL 12 2018". 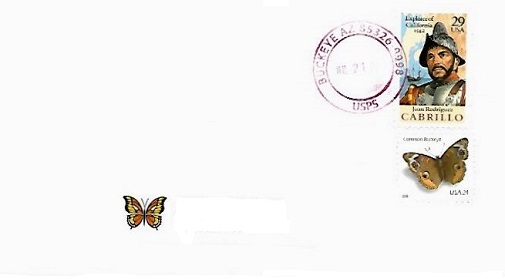 Hand cancellation: "PLOVER, IOWA 50573 JUL 11 2018". 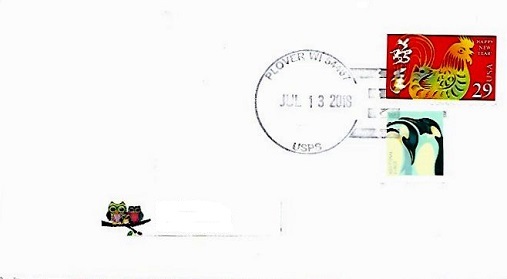 Hand cancellation: "PLOVER, WI 54467 USPS JUL 13 2018". 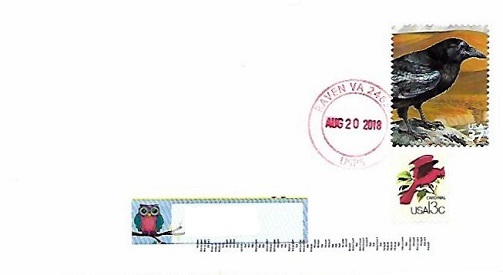 Hand cancellation: "RAVEN, VA 24639 USPS AUG 20 2018". 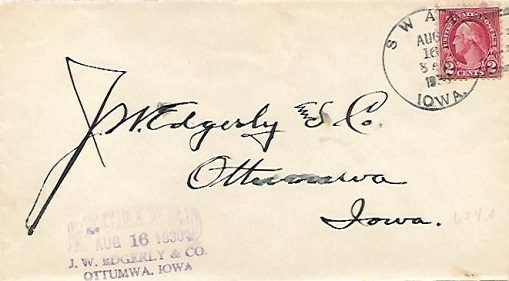 Hand cancellation: "SWAN, IOWA AUG 16 1930". 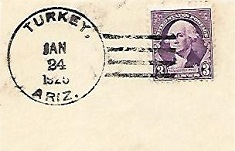 Hand cancellation: "TURKEY, ARIZ. JAN 24 1925"
Hand cancellation: "TURKEY, N.C. NOV 22 1945". 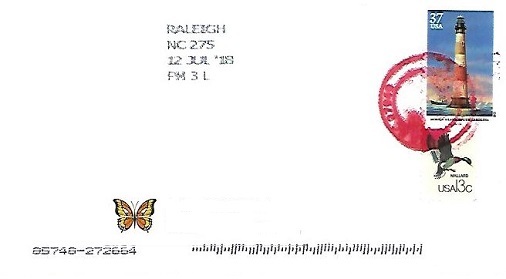 Hand cancellation: "TURKEY, NC 28393 USPS JUL 12 2018". 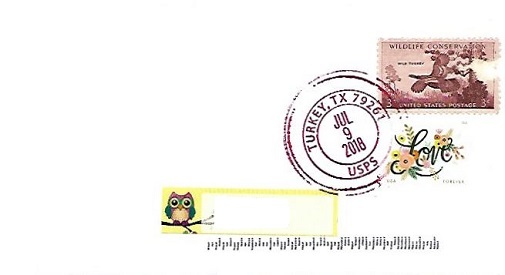 Hand cancellation: "TURKEY, TX 79261 USPS JUL 9 2018". 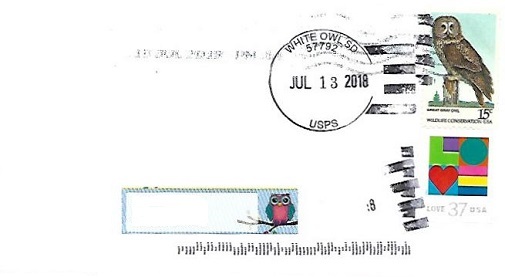 Hand cancellation: "WHITE OWL, SD 57792 USPS JUL 13 2018". 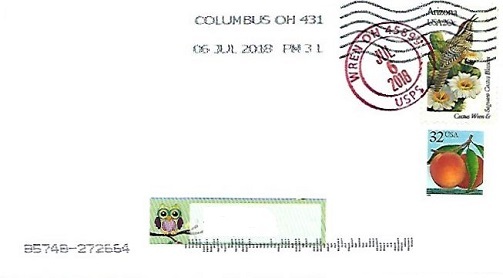 Hand cancellation: "WREN, OH 45899 USPS JUL 6 2018". 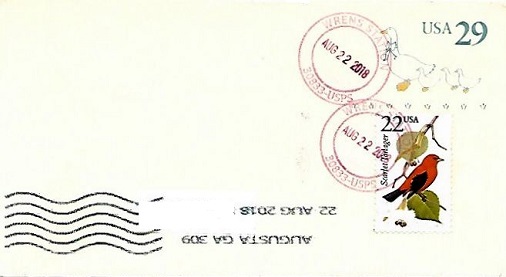 Hand cancellation: "WRENS STATION, 30833 USPS AUG 22 2018".